It is just about time for the start of the Third Annual Ultimate NHL Playoff’s Quarterfinal Round! Seven of the eight franchises have been here before. The 25th-seeded ’09-’10 San Jose Sharks are the lone debutant in this year’s Quarterfinal and they have an incredibly tough task as they face the top seeded ’76-’77 Montreal Canadiens. The winner of that match up, so the Canadiens, will face either the 12th-seeded ’84-’85 Philadelphia Flyers or the 13th-seeded ’74-’75 Los Angeles Kings in the Semifinal. This is the second year in a row that those two franchises are meeting in the Quarterfinal with the ’74-’75 Flyers defeating the ’74-’75 Kings last year. On the other half of the bracket, the 7th-seeded ’71-’72 New York Rangers face the 15th-seeded ’95-’96 Colorado Avalanche. It is the second time in the Quarterfinal for both of those franchises. The Avs made it all the way to the Semifinal last year, but with a different representative, while the ’71-’72 Rangers have been in all three UNP’s and made it to the Quarterfinal in the inaugural tournament. The winner of that series will face either the 6th-seeded ’82-’83 Edmonton Oilers or the 19th-seeded ’05-’06 Mighty Ducks of Anaheim, so the Oilers. Edmonton has reached the Quarterfinal in all three tournaments with three different teams and last year’s representative finished as the runner up. Meanwhile, Anaheim is in their second UNP Quarterfinal after having made it their in the inaugural UNP, but I would be surprised if they make it any further this year. So, up next, to start the Quarterfinal, the 7th-seeded ’71-’72 New York Rangers drop the puck against the 15th-seeded ’95-’96 Colorado Avalanche! 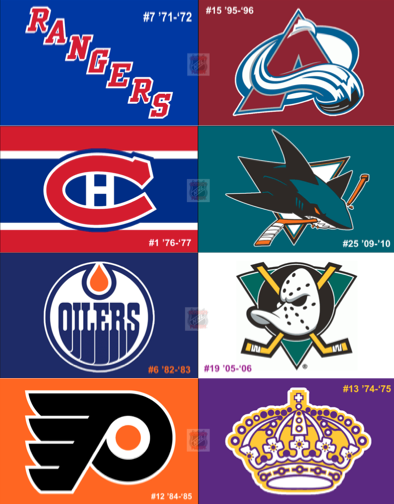 This entry was posted in Quarterfinal, Ultimate NHL Playoff and tagged Colorado Avalanche, Edmonton Oilers, Los Angeles Kings, Mighty Ducks of Anaheim, Montreal Canadiens, New York Rangers, Philadelphia Flyers, Quarterfinal, San Jose Sharks, Ultimate NHL Playoff. Bookmark the permalink.